Involved in a Multiple Vehicle Crash? Most car accidents involve one or two vehicles, but sometimes multiple vehicles can be involved in a single crash event. These multiple vehicle car accidents can be complicated and messy, both in terms of investigation and determining fault, and in ironing out insurance coverage and where compensation for injuries can be found. 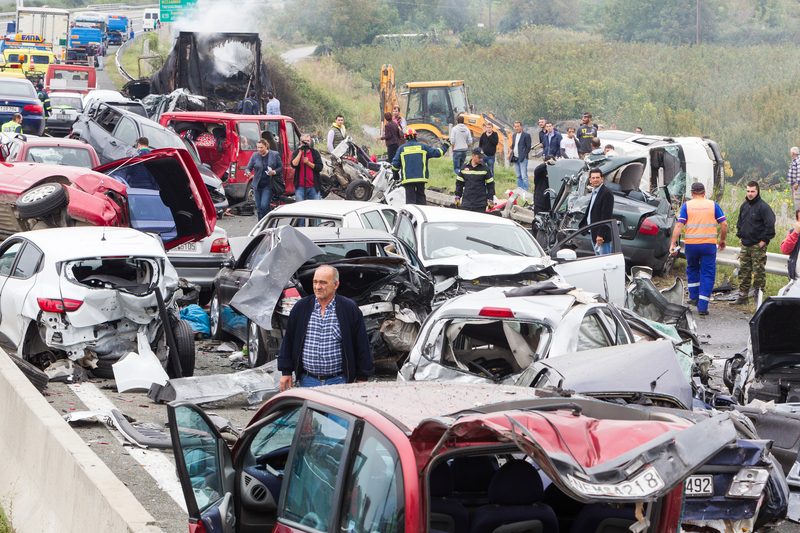 The most common type of multi-vehicle crash is what we sometimes call a pileup. One vehicle in a long line of vehicles may suddenly stop for some reason, causing the cars behind that vehicle to crash into each other like a line of dominoes. Or, a car at the back of a long line may fail to notice that traffic ahead has stopped and rear end the car in front of them, pushing that car into the next car in line and so on through several cars. Multiple vehicle crashes create a situation where passengers are subject to not just one, but two or more impact events. For example, in a pileup, your car may be rear-ended and hit from behind and then forced forward and hit the car in front of you. You suffer whiplash from both directions. The result can be multiple injuries, from both impacts. If you or someone you know has been involved in a multiple vehicle collision, speak with one of our multiple vehicle collision attorneys in Utah today for more information on how we can help you recover damages. Multi-vehicle crashes can be complicated by another problem: Insurance. When one person is at fault for a multi-vehicle crash, that person may or may not have enough insurance coverage to adequately compensate all the injured parties involved in the crash he or she caused. This is one of the many reasons that every driver should have adequate Uninsured Motorist (UM) and Underinsured Motorist (UIM) coverage. Learn more about what UM and UIM insurance coverage is and why it's so important for drivers to have it. Multiple vehicle collisions can be serious, and if you’ve been involved in a multi-car accident call one of our multiple vehicle collision attorneys today to discuss your options for obtaining fair compensation for your injuries. If you or a loved one has recently been involved in a pileup car accident, our multiple vehicle collision attorneys can give you the personal care you need. In the wake of an accident, we will do everything possible to make sure you are informed, protected, and fairly compensated. Our expert pileup accident lawyers will travel anywhere within the state of Utah to make sure you have the legal assistance you need. Our initial consultation is always free, and if you don’t recover damages in the trial, we don’t get paid. You deserve competent, dedicated multiple vehicle crash attorneys who will give your case and the people involved the personal attention they deserve. We never hand off cases to paralegals or case managers, Dustin Lance or Jessica Andrews will personally handle your situation. Schedule a free consultation today!